Partnership provides opportunity to adapt Parents as Teachers service components to a ‘virtual’ format to reach more families in underserved communities and support tech-savvy parents; families will interact with trained parent educators and other participating families through a web-based teleconference platform. Families in the Parents as Teachers and USC School of Social Work Telehealth study will receive Parents as Teachers services via live, web-based conference sessions. The Parents as Teachers @ USC Telehealth program is fundamentally expanding the ways parent education and family support services are provided, from in-home visiting to a live online platform. 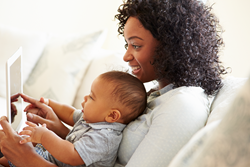 Parents as Teachers National Center and the University of Southern California School of Social Work have successfully launched a pilot program marrying the Parents as Teachers evidence-based home visiting model with USC Telehealth. Funded through the Coalition for Research on Engagement and Well-Being (CREW) and the Overdeck Family Foundation, the pilot represents a transformational move by home visiting and family support leader, Parents as Teachers, to adapt its services to a ‘virtual’ format to reach more families in underserved communities, and to support today’s tech-savvy parents. Families in the study will receive Parents as Teachers service components via live, web-based, video conference sessions. Individualized, live personalized visits will take place online, along with child health and development screenings, community support referrals, and group gatherings with other parents. The project was recognized as a “Commitment to Action” by the Clinton Global Initiative (CGI) in 2015. USC School of Social Work graduate fellows are receiving rigorous training in the Parents as Teachers service model and will serve a total of 65 families in the pilot study. Participating parents, recruited from the LA Best Babies Network, are provided tablets and wireless internet access for the duration of the study, which will enable them to connect with their parent educators. Researchers will begin gathering qualitative analyses this summer, with comprehensive results expected next summer. About Parents as Teachers: Founded in Missouri in 1984, Parents as Teachers serves more than 212,000 children in all 50 U.S. states, more than 115 Tribal organizations, schools and communities, and six other countries. Its internationally recognized network of affiliates uses an evidence-based model to deliver parent education primarily through personal visits and group meetings, equipping parents with knowledge and resources to prepare their children, from birth through kindergarten, for a stronger start in life and greater success in school. Parents as Teachers programs operate in various settings, including schools, hospitals, faith-based organizations and housing communities. For more information, visit http://www.ParentsAsTeachers.org. About USC School of Social Work: The University of Southern California's School of Social Work (http://www.usc.edu/socialwork) ranks among the nation's top social work graduate programs. A recognized leader in academic innovation, experiential learning, online education and translational research, the school prepares students for leadership roles in public and private organizations that serve individuals, families and communities in need. USC is dedicated to reinventing the profession, furthering knowledge and changing social institutions locally, nationally and globally. The school has made innovation a signature feature of its academic and research enterprise, leveraging technology in social work education, clinical practice, research and community development, as evidenced through the creation of an advanced online platform for distance learning, virtual humans for graduate-level teaching, and a university-based clinic offering mental health services over the Internet.